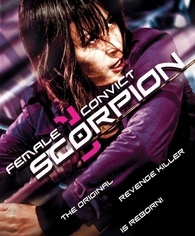 "An Example of a Poor Screen Writing"
"Sasori" aka "Female Convict: Scorpion" is a 2007 Chinese-Japanese co-production. Based on the Japanese manga and 70's film series with the same name, Miki Mizuno of "Gamera 2" fame is Nami. A beautiful woman who is forced to kill her boyfriend's father. After her boyfriend arrives, he finds Nami holding a knife to her boyfriend's sister. After killing her, she is taken into police custody and is put into a harsh prison environment that is kill or be killed. This film tries too hard to be smart and it leaves you with more questions than answers to the villain's true plot to the film. Why did the villain want the boyfriend's father dead? Why did we not learn who the villain was until the last half hour of the film? Why were the fight scenes with Nami and the people who forced her to kill her boyfriend's father so short at the end of the film? The whole damn prison fight sequences went on and on, but this was like two second kills here. This film is nothing more but an example of poor screen writing. As an audience who are watching Nami go out for revenge are stuck watching her fight in a prison and questioning when she is going to be getting her vengeance. Where the writing is poor for most of the film, the action was mostly entertaining. I will give it that. Film gets a dismal 2.5/5. This is my third outing with the despicable Media Blasters, the other two being Devil Dog and Destroy All Monsters. I am going to guess the Chinese studio who released the film handled the transfer for the film. It's amazing how rough a five year film can actually look. The film has constant print damage througout. There is a scene or two that you can tell is meant to have print damage as part of the story, but, that you can tell is faked print damage. Also, there's a few shots that looked blurry. Also, the film looks totally washed out and contrast is blown out. I am not sure if it's a director's choice or not, but this does not bode well. Video scores a 3/5. Media Blasters has given us two audio tracks present on this disc; Chinese DTS-HD MA 2.0 and 5.1. Why we need a 2.0 track when 5.1 is fine as it is make that whole audio track questionable and a waste of space. The 5.1 track sounds great. We can hear sounds of Nami's sword hitting nicely. However, something feels a bit missing from the audio. Also, this registers as Japanese even though it's Chinese on my system. An authoring error by Media Blasters, go figure. I give the audio a 4/5. We only have trailers for Female Convict: Scorpion; Crows Zero; and Hansel and Gretel. The two trailers for the last two titles do have my interest and I might seek them out in the future. However, as far as extras go, this is a weak offering from Media Blasters. 1.5/5. Why was this film made? Can someone answer this question for me? I really don't know. It's just a poorly written and paced action movie that really had it's climax in the whole prison sequence with 45 minutes of filler after it. Don't pay more than $6 like I did for this. 3/5.